The highly infectious norovirus, or stomach flu bug, causes a very common illness, affecting hundreds of millions of people who come into contact with it through contaminated food, water, surfaces or other people every year. Now, scientists have discovered that copper and its more than 300 different alloys don't just fight norovirus - copper destroys it. Simulating contamination via touch, researchers found that norovirus could not survive on any dry surface containing more than 60% copper. The findings do not apply solely to norovirus either but to a range of various fungi and bacteria. Armed with this knowledge, lead study author Sarah Warnes noted that copper-rich antimicrobial surfacing in high-traffic public areas, especially care facilities, could reduce norovirus exposure and significantly cut down how many people get sick. This research reaffirms a previous study out of the University of Nebraska that was the first to demonstrate that when microbes were exposed to dry, copper-infused surfaces, hundreds of millions of bacterial cells died within minutes. Copper's antimicrobial properties have been known for thousands of years, dating back to an ancient Egyptian text that discussed using the mineral as a sterilization agent for wounds and drinking water. The Father of Modern Medicine, Hippocrates, even mentioned copper as a treatment for leg ulcers circa 400 B.C. Further ancient copper cures span the gamut of treatments, including for infected ears, purging the stomach of intestinal parasites and lung diseases. Likewise, silver has been used for centuries to fight germs as well. Silver was used in the creation of cups, plates and eating utensils (that's why they call it 'silverware') to keep pathogens at bay. In more recent times, American pioneers would place silver or copper coins in their drinking water casks to keep it germ-free. Conventional medicine has not respected ancient health traditions. 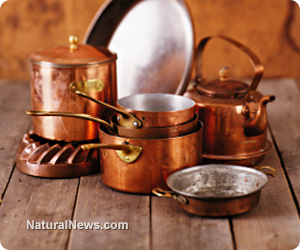 Although various forms of colloidal silver solutions have been used for hundreds of years as a natural antibiotic, the U.S. Food and Drug Administration (FDA) ran a scaremongering campaign against it, claiming it would turn people silver. No, really. In reality, the amount of silver in these solutions is in the hundred parts per million range, way below the amount it would take to actually turn anyone's skin silver. With humans ingesting silver for thousands of years, if it were really so dangerous, we'd see a lot more silver people walking around by now. We have witnessed an overuse of antibiotic pharmaceutical drugs in modern times that has led to the rise of antibiotic-resistant superbugs such as MRSA - or methicillin-resistant Staphylococcus aureus - an infectious, flesh-eating bacteria found primarily in hospitals (where, consequently, it has been shown to spread the fastest and can do the most damage to people who are the most vulnerable). While mainstream medical science has thus far been clueless as to how to curb this growing epidemic, the norovirus researchers found that dry copper surfaces also kill MRSA within minutes of contact. Interestingly, most hospitals use stainless steel surfaces. These researchers were able to demonstrate in a side-by-side microscopic comparison how copper beats out stainless steel in wiping out MRSA (see video here). Stainless steel had little to no effect on the superbug. Perhaps most important, unlike antibiotics, microbes do not build up a resistance to copper or silver. Currently, data shows that one in every 20 hospital patients contracts an infection while hospitalized; this results in 1.7 million sick people and approximately 100,000 U.S. deaths each year at a cost of $10 billion annually. With the staggering amount of research showing copper and silver's potential to reduce the adverse health effects from out-of-control bacteria, specifically in a hospital setting, it's astonishing that these solutions are being ignored or even suppressed.